What will your bling be this spring? Color is hot and tasty for spring 2007, mouthwatering hues that pop are in demand. Shedding the dowdy colors of winter, designers have chosen a palette of candy box colors of strawberry ice, sky blue, golden apricot, tarragon, and grape mist…soft tones full of flavor! Colorful gemstones of pastel colors are commanding the most attention this spring. Popular hues to look for in fine jewelry are citrus tones of lemon and lime citrine, green and golden beryl, pale lavender and green amethyst, additionally soft tints of pink quartz, morganite, aquamarine, labradorite, chalcedony, moonstone, apatite, and prehnite. In its recent catalog, Neiman Marcus previews this season’s colors in its selection of “Statement Rings”, this year’s version of the cocktail ring. In addition to the classic faceted and cabochon cuts, when choosing a piece of jewelry this season look for gemstone jewelry with rough crystals, tumbled, or unfaceted shapes to add zest to your wardrobe. Belgian police offered a $2.6 million reward Monday for information that will help located a man who stole $28 million in diamonds from an Antwerp bank last week. The ABN Amro bank discovered the theft on March 5, 2007. It is believed that the stones were taken either Monday morning or the previous Friday from safety deposit boxes in the vault. It is estimated that 120,000 carats were stolen. It is clear that the man had been planning the robbery for sometime. He had carefully gained the trust of bank employees for the past year and had become one of several trusted diamond traders who were given access to the vault by electronic card. He went by the name Carlos Hector Flomenbaum from Argentina. This is now believed by the authorities to have been a false identity because a passport in the same name was stolen from Israel a few years ago. 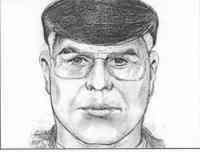 A composite photo has been released, of a gray-haired man, 6 foot, 3 inches tall and aged between 55 and 60. The man is said to speak English with an American accent and often wears a baseball cap. The Belgian police are appealing to anyone who may have gotten to know the man during his time in the city to come forward. Chrysoprase the most valued variety of chalcedony means “golden apple” in Greek. A semitransparent to translucent apple green stone, its finest color is the light to medium yellowish green of the fruit. In poor quality material the stone may be opaque. The highest quality material is of even color, without flaws, fractures, inclusions, cavities or other imperfections. Most green stones derive their color from chromium or vanadium, where natural chrysoprase owes its color to nickel silicate impurities. It is rare but chrysoprase can be colored by chromium rather than nickel producing a green to bluish green color. In some chrysoprase the color may fade when heated or exposed to sunlight. Although the color is alluring, chrysoprase is not commonly known today because of its limited availability. Revived interest in chrysoprase came in 1965, with the discovery of the gem in Queensland, Australia, the area has since been producing superior quality chyrsoprase for commercial use. The finest Queensland gem material ranging from apple green to a saturated medium to dark green can resemble fine jade. Brazil produces a chrysoprase often found in an olive green color. Other localities include California, India, the Ural in Russia, and Austria. Dealers created treated alternatives, to compensate for the rarity of the stone before the Queensland find made chrysoprase more available. These treated alternatives are often sold as green agate or green onyx, that are grayish chalcedonies that have been soaked in a mixture of water, acid, and chromium, or nickel compounds, then heated and dried. The hues that are created from treating green chalcedony are often a green to bluish green color, rather the intense green of the naturally colored gem material. Bloodstone (also called Heliotrope) is an opaque, dark-green, spotted variety of chalcedony with nodules of bright-red jasper that are scattered throughout stone. The presences of iron oxides in the green stone cause the spots of red; in smaller pieces of mineral the red does not appear. The characteristic red spots are what give the stone its name as they seem to resemble blood. During the Middle Ages, bloodstone was greatly prized, as the bright-red spots were thought to be the blood of Jesus Christ. The stone was attributed with special powers and used in sculptures representing flagellation and martyrdom. This mineral is considered an intense healing stone and a “stone of courage”, one that provides the revitalization of love, relationships, and friendships. The finest opals display a beauty that is challenging to describe in words, and writers have compared the opal to volcanoes, galaxies, and fireworks. Fire opals are unique in the abundant world of opals. Fire opals hardness is 6 to 6.5 on the Mohs scale, which places it among gemstones which require a protective setting, especially when set in a ring. The fire opals color and clarity make its one of the few opal types which is sometimes faceted. When a fire opal displays an attractive play-of-color, it’s usually cut as a cabochon to feature the phenomenon. The oval shape is regarded as the classic shape for valuable fire opals. Mexico is has the most significant fire opal deposits in the world. The orange-red stones are found in other countries such as, Honduras, USA, Canada, Australia, Ethiopia, and Turkey, most of these sites are of little economic significance. However, in recent years Brazil has discovered fire opals colored yellow to orange, they are distinguished by their beautiful colors, a slight clouding, and no play of color. What is most remarkable about the Brazil deposits is the size of the raw stones, which are as large as a man’s fist. Avoid purchasing fire opals with a cloudy look, which is a sign that the stone is drying out and in danger of cracking. The water content in opals is unevenly distributed, therefore opals need to avoid great heat, which would cause the stone to artificially dry and crack. Padparadscha sapphires are the rarest of sapphires from the gem class termed corundum. One of the world’s most expensive gems, padparadscha (pronounced Pad-para-dscha) sapphires are mostly unknown to consumers because there are so few in circulation. Padparadscha sapphires are rivaled by no other gemstone species, since there is no other colored stone that compares to the striking beauty of this unique mix of pink and orange. These fancy sapphires are very beautiful and typically command a high price per-carat. Salmon, sunsets, lotus flowers, and tropical fruits are terms used to describe natural padparadscha sapphires; the color range is a delicate combination of the two colors: pink and orange. Despite the varying color descriptions the industry agrees that padparadscha sapphire colors are intensely saturated, and range from light to medium pinkish orange to orange-pink. Padparadscha is derived from the Sanskrit word padmaraga meaning “lotus flower”. The petals from the finest lotus blossoms are a harmonious blend of pink and orange. The unique hues or color centers of padparadscha’s are caused by trace elements of iron and chromium. Over time the accepted color range for padparadscha has changed; the term once described, ranges of color from yellowish orange to orangey red, with an assortment of tones and degrees of saturations. Today, a gem must fall into a narrower color range. Therefore a reddish-orange or a reddish-brown colored sapphire should not be classified as a Padparadscha since a true Padparadscha is classified as specific mix of pink and orange. For thousands of years, padparadshca’s have been sifted from the river gravel of Sri Lanka, with the best natural specimens coming from Ceylon. Ceylon is the original locality for padparadschas; many purists today believe the term should be restricted only to stones from this area. It has been only in the last few decades that other countries have produced similar color tones associated with Ceylon Padparadschas. Madagascar is producing the majority of the stones available on the market, they are mostly more pink than orange (20-30% orange and 70-80% pink). These stones are classified “Padparadscha” but are normally sold at cost 20% less than the “Ceylon Padparadscha”. The Tanzania Tunduru district produces “Padparadscha-like” orange sapphires, of a reddish orange color with tones of brown and slight hints of pink. These sapphires although beautiful are usually not classified as “Padparadschas” because of the significant tones of red and brown. The largest diamond found in the last 13 years known as the “Lesotho Promise” was sold at auction for $12 million and is expected to fetch in excess $20 million once it has been cut down. The 603-carat diamond the tenth largest white diamond ever to have been found went under the hammer at the Antwerp Diamond Center and was sold to the South African Diamond Corporation, owner of the luxury jewelers Graff. The diamond is expected to be cut into a large heart-shaped diamond and several smaller stones which will then be sold. The uncut size of the diamond is a third bigger than the size of a golf ball. In the June issue of “Vanity Fair plus Jewellery”, I read four fantastic stories of eccentric women and their extravagant jewelry. The 2nd Duke of Westminster was renowned for his habit of giving expensive jewellery not only to his mistress but also to his wives. His second wife, Loelia, writes about his unusual ways of giving jewellery in her memories. He stashed one of her engagement presents, an oblong platinum powder box with two ribbons of diamonds, and sapphires running across it, in her suitcase. Later that night she woke up and found she’d been sleeping on a diamond and emerald brooch. The next morning, when she was fishing in her bag for her passport, she discovered a diamond and ruby bracelet with a long diamond tassel. His generosity may have stemmed from guilt: he was in the process of breaking off a long-standing affair with Coco Channel. They had nearly married but she declined, noting: “There are a lot of duchesses, but only one Coco Channel.” They were a volatile couple and had a famous row aboard a cruise liner. The duke sought her forgiveness by giving her an emerald that he kept in his traveling safe. She was standing on deck as he approached her with the stone. She took it and, without a word, dropped it overbroad. He married Loelia shortly after. The Hope Diamond is probably the most famous jewel in the world, but it has always brought bad luck to whoever owned it. It originated in India and was sold to Louis XIV. The bad luck started with his grandson Louis XVI: he and his wife Marie Antoinette were executed in the French Revolution. The gem disappeared until 1839, when it was sold to Henry Philip Hope of Hope & Co. banking company. They eventually sold it to pay off gambling debts. Cartier acquired the diamond in 1910 and sold it to the American socialite Evalyn Walsh McLean, wife of Washington Post owner Edward McLean. Soon afterwards everyone around her started getting ill or dying. First her mother-in-law died of pneumonia and then six years later her son was killed in a car accident. Her husband ran off with another woman and then went on to die from alcohol poisoning. In 1932 the Post went bankrupt and Evalyn was forced to auction it. Finally, in 1946, her 25-year-old daughter took a fatal overdose of sleeping pills. Evalyn herself died the next year, owing money, and the diamond was again sold to pay off debts- to Harry Winston. Harry Winston, having decided that he didn’t want to have the diamond’s bad luck rub off on him, donated it to the Smithsonian Institution. He was so unconcerned about the fate of the stone that he is said to have put it in the post. Pairs in the 1890’s was the domain of “les grandes horizontals”. These glamorous women were high-class prostitutes who only slept with their clients for extraordinary sums of money. Their favorite watering hole was the restaurant Maxim’s, where the demi-monde used to gather night after night. Two of the most famously beautiful courtesans were Liane de Pougy and Caroline “La Belle” Otero. Between them, they’d been to bed with just about every crown head of Europe, and nearly married one or two of them. Of course they detested each other. One evening La Belle Otero turned up at Maxim’s wearing a magnificent diamond necklace that a rich admirer had given her. While the crowd at Maxim’s ooh-ed and ahh-ed over her spectacular new acquisition, Liane did nothing but scowl in the corner. The next night she appeared dressed entirely in black, without a piece of jewellery anywhere on her. But behind her was her maid, wearing every single piece of jewellery that Liane owned. The Duchess of Windsor was not known for her tact and never was this trait more visible than when she boasted to everyone that the jewellery she wore was always her own design. Jewellers would be irritated, but what could they do? Her patronage was too important to the trade. Finally, one jeweler decided to teach her a lesson. Fulco Santostefano della Cerda, the Duke of Verdura , was an Italian aristocrat and a genius when it came to jewellery design. His work was characterized by witty takes on nature, with motifs of shells, animals, birds, and flowers. According to Ward Landrigan, the current owner of Verdura, his jewellery complemented the “excellent taste of women who did not need to impress with their wealth”. The Duke of Verdura and the Windsors were very close-they even took a holiday together. Naturally, the English duke bought lots of jewellery for the duchess from his Italian friend. Once he bought her a fabulous ruby and diamond brooch, which the duchess wore everywhere, telling anyone who would listen that she had designed it herself. Eventually she tired of wearing it and tried to return it to Verdura, hoping he would exchange it for something else. He promptly told her that, as he only exchanged pieces that he had designed himself, he didn’t think he could take back a piece which he’d heard was her own creation. She never returned to his shop again. A man was arrested for smuggling 666 rough diamonds in his underpants, in Brazil’s remote Amazon state of Rondonia. The police were conducting a routine road check when they became suspicious of “Captain Underpants” nervousness. After finding equipment that measure diamonds in the man’s car the police searched the man finding the diamonds in his skivvies. The diamonds, worth about $200,000, were smuggled out of the Indian reservation of the Cinta Larga tribe in Rondonia. 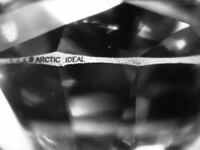 Diamond laser inscriptions are a growing trend for a technique that provides an easy way to identify a diamond. 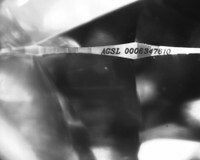 Laser inscriptions usually contain the certification laboratory initials and the certification's number. 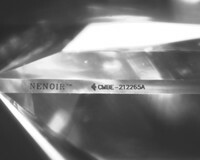 We have a few photographs that we have taken of different laser inscriptions that we have seen on diamonds in the office that I wanted to share.